In his 1976 book The Selfish Gene, biologist Richard Dawkins introduced the word “meme” to refer to a hypothetical unit of cultural transmission. The discussion of the meme concept was contained in a single chapter of a book that was otherwise dedicated to genetic transmission, but the idea spread. Over decades, other authors further developed the meme concept, establishing “memetics” as a field of study. Today, the word “meme” has entered the popular lexicon, as well as popular culture, and is primarily associated with specific internet artifacts, or “viral” online content. Although this popular usage of the term is not always in keeping with Dawkins’ original conception, these examples from internet culture do illustrate some key features of how memes have been theorized. This essay is principally concerned with two strands of memetic theory: the relation of memetic transmission to the reproduction of ideology; and the role of memes in rhetorical analysis, especially in relation to the enthymeme as persuasive appeal. Drawing on these theories, I will advance two related arguments: ideology as manifested in discursive acts can be considered to spread memetically; and ideology functions enthymemetically. Lastly, I will present a case study analysis to demonstrate how the use of methods and terminology from rhetorical criticism, discourse analysis, and media studies, can be employed to analyze artifacts based on these arguments. Examples of memes presented by Dawkins include “tunes, ideas, catch-phrases, clothes fashions, ways of making pots or building arches” (p.192). The name “meme” was chosen due to its similarity to the word “gene”, as well as its relation to the Greek root “mimeme” meaning “that which is imitated” (p.192). Imitation is key to Dawkins’ notion of the meme because imitation is the means by which memes propagate themselves amongst members of a culture. Dawkins identifies three qualities associated with high survival in memes: longevity, fecundity, and copying-fidelity (p.194). Distin (2005) further developed the meme hypothesis in The Selfish Meme. Furthering the gene/meme analogy, Distin defines memes as “units of cultural information” characterized by the representational content they carry (p.20), and the representational content is considered “the cultural equivalent of DNA” (p.37). This conceptualization of memes and their content forms the basis of Distin’s theory of cultural heredity. Distin then seeks to identify the representational system used by memes to carry their content (p.142). The first representational system considered is language, what Distin calls “the memes-as-words hypothesis” (p.145). Distin concludes that language itself is “too narrow to play the role of cultural DNA” (p.147). Balkin (1998) took up the meme concept to develop a theory of ideology as “cultural software”. Balkin describes memes as “tools of understanding,” and states that there are “as many different kinds of memes as there are things that can be transmitted culturally” (p.48). Stating that the “standard view of memes as beliefs is remarkably similar to the standard view of ideology as a collection of beliefs” (p.49), Balkin links the theories of memetic transmission to theories of ideology. Employing metaphors of virility similar to how other authors have written of memes as “mind viruses,” Balkin considers memetic transmission as the spread of “ideological viruses” through social networks of communication, stating that “this model of ideological effects is the model of memetic evolution through cultural communication” (p.109). Balkin also presents a more favorable view of language as a vehicle for memes than Distin presented, writing: “Language is the most effective carrier of memes and is itself one of the most widespread forms of cultural software. Hence it is not surprising that many ideological mechanisms either have their source in features of language or are propagated through language” (p.175). Balkin approaches the subject from a background in law, and although not a rhetorician and skeptical of the discursive turn in theories of ideology, Balkin does employ rhetorical concepts in discussing the influence of memes and ideology: “Rhetoric has power because understanding through rhetorical figures already forms part of our cultural software” (p.19). Balkin also cites Aristotle, remarking that “the successful rhetorician builds upon what the rhetorician and the audience have in common,” and “what the two have in common are shared cultural meanings and symbols” (p.209). In another passage, Balkin expresses a similar notion of the role of shared understanding in communication: “Much human communication requires the parties to infer and supplement what is being conveyed rather than simply uncoding it” (p.51). Although Balkin never uses the term, these ideas are evocative of the rhetorical concept of the enthymeme. Aristotle himself discussed the enthymeme, though the concept was not elucidated with much specificity. Rhetorical scholars have since debated the nature of the enthymeme as employed in persuasion, and Bitzer (1959) surveyed various accounts to produce a more substantial definition. Bitzer’s analysis comes to focus on the enthymeme in relation to syllogisms, and the notion of the enthymeme as a syllogism with a missing (or unstated) proposition. Bitzer states: “To say that the enthymeme is an ‘incomplete syllogism’ – that is, a syllogism having one or more suppressed premises – means that the speaker does not lay down his premises but lets his audience supply them out of its stock of opinion and knowledge” (p.407). Bitzer’s formulation of the enthymeme emphasizes that “enthymemes occur only when the speaker and audience jointly produce them” (p.408). That they are “jointly produced” is key to the role of the enthymeme is successful persuasive rhetoric: “Owing to the skill of the speaker, the audience itself helps construct the proofs by which it is persuaded” (p.408). That the enthymeme’s “premises are always drawn from the audience,” and the “successful construction is accomplished through the joint efforts of speaker and audience,” Bitzer defines as the “essential character” of the enthymeme. This joint construction, and supplying of the missing premise(s), resonates with Balkin’s view of the spread of cultural software, as well as various theories of subjects’ complicity in the functioning of ideology. McGee (1980) supplied another link between rhetoric and ideology with the “ideograph”. 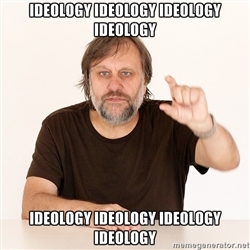 McGee argued that “ideology is a political language composed of slogan-like terms signifying collective commitment” (p.15), and these terms he calls “ideographs”. Examples of ideographs, according to McGee, include “liberty,” “religion,” and “property” (p.16). Johnson (2007) applies the ideograph concept to memetics, to argue for the usefulness of the meme as a tool for materialist criticism. Johnson argues that although “the ideograph has been honed as a tool for political (“P”-politics) discourses, such as those that populate legislative arenas, the meme can better assess ‘superficial’ cultural discourses” (p.29). I also believe that the meme concept can be a productive tool for ideological critique. As an example, I will apply the concepts of ideology reproduction as memetic transmission, and ideological function as enthymematic, in an analysis of artifacts of online culture popularly referred to as “memes”. As Internet culture evolved, users adapted and mutated the term “meme” to refer to specific online artifacts. Even though they may be considered a type of online artifact, Internet memes come in a variety of different forms. One of the oldest and most prominent series of image macro memes is the “LOLcats” series of memes. The template established by LOLcats of superimposing humorous text over static images became and remains the standard format for image macro memes. Two of the most prominent series of these types of memes are the “First World Problems” (FWP) and “Third World Success” image macros. Through analysis of these memes, it is possible to examine how the features of these artifacts and discursive practices demonstrate many of the traits of memes developed by theorists, and how theories of memetic ideological transmission and enthymematic ideological function can be applied to examine ideological characteristics of these artifacts. Journal Of Speech, 66(1), 1-16. The definition matters, in other words, not purely for linguistic nit-picking, but because we seldom talk about gentrification in isolation. More often, we’re talking about its effects: who it displaces, what happens to those people, how crime rates, school quality or tax dollars follow as neighborhoods transform. And if we have no consistent way of identifying where “gentrification” exists, it then becomes a lot harder to say much about what it means. This is all very academic, but there’s a corollary lesson for laymen: Whatever point you’re making about “gentrification” is undermined by the fact that the word has no clear, singular meaning. It’s clear that “gentrification” is still a vague, imprecise and politically loaded term. We not only need better, more objective ways to measure it; we need to shift our focus to the broader process of neighborhood transformation and the juxtaposition of concentrated advantage and disadvantage in the modern metropolis. The panelists who participated in a discussion on “Gentrification, Integration and Equity,” hosted by Next City on Dec. 3rd, had definitions that varied widely, and not all of them agreed that it was a bane. But the issue of better-off residents moving into low-income neighborhoods, no matter how one defines or slices it, does call for cities and communities to come up with ways to counter the ill effects and develop alternative, inclusive visions for redevelopment. Spurred on by the recent debate on the impact of limited housing supply on home prices and rents, thereby “capping” gentrification, (taken on fantastically by geographer Jim Russell in posts like this), I decided to do a quick analysis of large cities and see how things added up. The analysis was premised on a couple observations of gentrification, one often spoken and one not. One, gentrification seems to be occurring most and most quickly in cities that have an older development form, offering the walkable orientation that is growing in favor. Two, gentrification seems to be occurring most and most quickly in areas that have lower levels of historic black populations.